The thalamus is a group of cells placed centrally in the brain that serve a critical role in controlling how both sensory and motor signals are passed from one part of the cerebral cortex to another. Essentially, all information reaching the cerebral cortex and thus consciousness is relayed through the thalamus. The role of the thalamus in controlling the flow of information (such as visual, auditory, and motor) to the cortex has only recently begun to be understood. This book provides an in-depth look at the function of the thalamus and its role as relayer of information to the cerebral cortex. The authors explore how the thalamus controls messages that are passed to the cortex and they introduce the novel suggestion that the thalamus serves a critical role in controlling how messages pass from one part of the cortex to another. 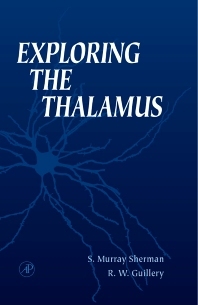 Exploring the Thalamus is a comprehensive, up-to-date reference for researchers. It discusses problems concerning the function and structure of the thalamus and concludes each chapter with thought-provoking questions regarding future research. The Nerve Cells of the Thalamus. The Afferent Axons to the Thalamus. Function of Burst and Tonic Response Modes in the Thalamocortical Relay. Two Types of Thalamic Relay. State University of New York, Stony Brook, U.S.A.
University of Wisconsin School of Medicine, Madison, U.S.A.